A Dry Tortugas fishing trip is the quintessential Florida fishing experience and is a 'definite must' for avid fishermen planning a Key West vacation. These are the last of the Florida Keys, and the Dry Tortugas are positioned at the furthest west point in this long chain of island gems. Home to Fort Jefferson on Garden Key, the Dry Tortugas National Park is many things to different people. However for anglers, with the strong currents, clear water, and big fighting fish, this is paradise for sport fishing enthusiasts. Even with the restricted areas now in place, fishing Florida Keys at Dry Tortugas, is productive fishing at its best. In the days of Ernest Hemingway and Zane Grey, there were no Florida fishing restrictions to hamper the where's and how's of fishing Florida Keys. Now, the 151 square nautical mile Tortugas Ecological Reserve, once a favorite fishing spot of Hemingway and his friends, is off limits. The Tortugas Ecological Reserve, part of the Florida Keys National Marine Sanctuary, is broken into 2 sections, Tortugas South and Tortugas North. The following Tortugas Ecological Reserve Map puts these two sections into perspective in relation to the Dry Tortugas National Park where Fort Jefferson is. 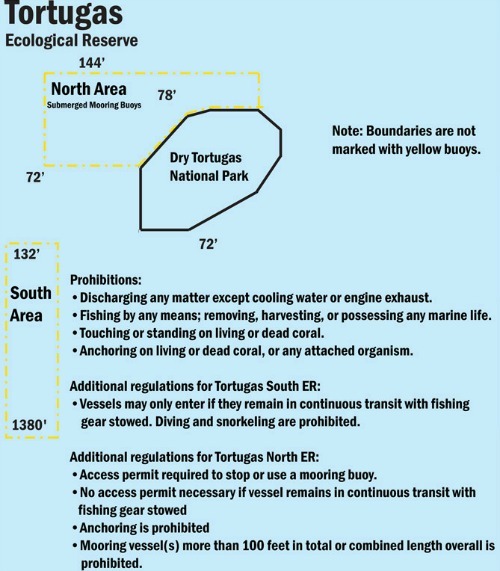 This Dry Tortugas map also outlines the restrictions that are enforced for the Ecological Reserve. The reason for these new fishing regulations was to counteract the affects of overfishing in Florida. The results have been exemplary. Not only has there been a significant increase in the size and quantity of Florida fish, the overall health of the marine ecosystem including the coral, has improved. Throughout the Dry Tortugas the various sectors have different controls in place. In some sections you'll find that all activities including fishing are allowed. In other regions, fishing Florida Keys is allowed, but there are restrictions on activities such as spearfishing and harvesting lobster. Then there are areas such as the Ecological Reserve where no activities, other than direct and continuous transit are allowed. In other regions such as the Dry Tortugas Research Natural Area (RNA), Florida fishing is prohibited but activities including Florida Keys scuba diving and snorkeling are permitted. In the RNA, there is one area exempt from the no fishing rule. This is the 2 mile diameter area around Garden Key. This is an excellent area for Florida kayak fishing especially for targeting permit and bonefish. You'll just need to ensure you've brought the necessary equipment and kayak fishing gear as you must be self-sufficient. Due to the restrictions, and the greater distance from Key West, a Dry Tortugas fishing trip with one of the Key West fishing charters is advisable, at least for the first few outings. You'll find that there are several saltwater fishing charter companies out of Key West FL and Marathon Key specializing in fishing trips to this Florida Keys fishing mecca. I've partnered with FIshingBooker because they make choosing a charter incredibly easy. This is because they have a vast variety of search criteria so you can drill down to exactly what you want. For this reason I've chosen to work with them as an affiliate. Also, so you're fully aware, as an affiliate of FishingBooker, if you click a link to a charter, book it and go on it, I stand to earn a small commission. The charter does not cost you any more if you book here than if you book elsewhere because this is what being an "affiliate" means. For your convenience, I've included a quick preview below of some Florida Keys fishing charters that take fishing trips to the Dry Tortugas. These fishing charter previews give you quick at a glance information showing what they do and where they go.
. fishing tackle and more! This way if you decide there are other places in the Florida Keys you want to fish or you want to see who else takes Dry Tortugas fishing charters you can explore all of your options. Captain Santelli of Fish Key West - The Coolwater II has been fishing the waters off Key West as both a commercial fisherman and a charter fishing boat captain. His years of experience make it possible for you to target marlin, wahoo, sailfish, mahi mahi, king mackerel, grouper, tarpon, snapper, albacore tuna, and more. Fish Key West - The Coolwater I has a Captain who's years of fishing experienced combined with his fleet of Key West charter fishing boats helps make your Florida Keys fishing vacation a success. Plan on targeting some of the biggest and hardest hitting fish on your Key West charter fishing trip with Captain Santelli's crew. Fish Key West - The Outcast is 1 of 4 in Captain Santelli's fishing charter fleet. With his years of Florida Keys fishing experience you are able to ply the waters near or offshore fishing Key West for different pelagic species including sailfish, wahoo, king mackerel or more. As a sport fisherman, you're not only restricted on where you can fish, but also on bag limit. When fishing Dry Tortugas, you have a crossover of two areas, the Atlantic and the Gulf, and they're impacted by different fishing regulations. Due to these restrictions and regulations, these waters are heavily monitored by Rangers. Going with a deep sea fishing charter who knows where to fish, has the right equipment and necessary licenses, understands the rules and bag limits, can end up saving you serious penalties and fines. Another consideration for going Dry Tortugas fishing with a qualified deep sea fishing charter, is that they know what bait and lures to use. Fishing the Dry Tortugas is somewhat different than fishing elsewhere, and if you want to be successful, you'll need to know what the fish want. This region of the Florida Keys is also very primitive. This is another reason why Dry Tortugas trips with any of the Key West fishing charters is advisable. However, if you plan on fishing Dry Tortugas without hiring any Florida deep sea fishing charters, you should be aware of certain facts. You probably should contact the Ranger for the Dry Tortugas at 305-242-7730 before going, to find out what new restrictions or regulations may apply. Since there are no supplies or amenities available, you must bring an adequate supply of food and water, and have enough gas and back up batteries. You'll need to ensure that you've brought an arsenal of tackle along that includes a variety of rods, reels, lures, hooks, bait, and chum. You'll also need to include plenty of backup equipment. When planning a Dry Tortugas trip you must factor in the boat you'll use. Due to the greater distance from Key West FL, and the further out areas you'll explore when fishing Dry Tortugas, it's essential you have a larger boat with at least two motors, capable of higher speeds. Another consideration is the Florida weather. During the winter, the ocean can be rough, in the summer there's the ever present threat of thunderstorms and all year round you can encounter waterspouts. All of these factors means you must have a fast, reliable Dry Tortugas boat so you can get to shore quickly. Due to the restricted areas, you'll need to know where you can and can't go. Plus there are certain areas that are challenging to navigate such as Rebecca Channel, which in the winter months can be especially rough. Unless you're fully equipped, with plenty of experience navigating a boat at sea, chartered fishing trips are probably your safest and best way to experience the thrill of a Dry Tortugas fishing trip. Key West FL to Dry Tortugas is a distance of 68 nautical miles. Since a Dry Tortugas trip is a long day, a Dry Tortugas fishing charter usually involves spending at least one night out. Some of these offshore fishing charters include 2 - 3 day stays, anchoring overnight in the protected waters of the Dry Tortugas National Park at Garden Key. With the protectionist measures, reduced volume of fishermen, strong currents and clear water, you'll find some of the best Florida fishing is right here. When Dry Tortugas fishing, trolling or fishing the deep east-west ledges for the larger pelagic species like dorado, tuna, wahoo, marlin and sailfish can produce outstanding and multiple results. You can also spend time offshore fishing over reefs and wrecks for barracuda, cobia, and numerous species of snapper and grouper. You'll find that drift fishing and jigging will generate some spectacular strikes too. Night fishing is a plus on these stay overnight Dry Tortugas trips, with large tarpon and yellowtail being popular targets. However, if you're up to the challenge, you can head south to the outer edge of the continental shelf and the Gulf stream highway and prepare to battle swordfish. If you're angling for larger grouper and amberjack, you can plan on deep drop fishing and you'll likely reel in mutton snapper too. 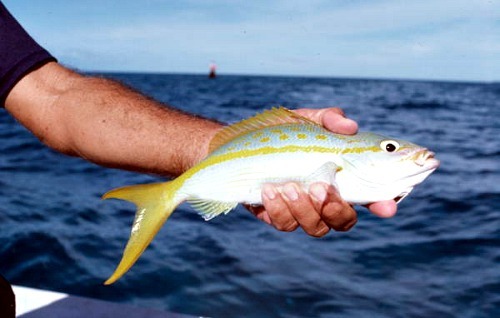 You'll also find that inshore reef fishing on light tackle for permit, and bonefish is highly productive. Even though there are a variety of restricted access areas, and regulations that must be followed, Dry Tortugas fishing is the ultimate sport fishing experience. 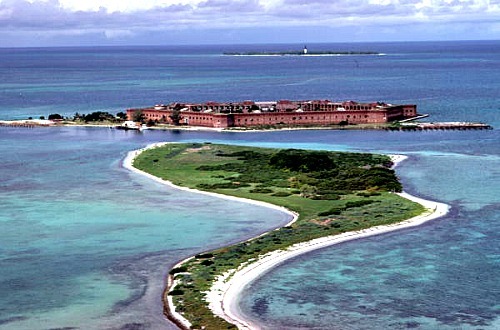 On your next Florida Keys vacation, if time and money permits, include a Dry Tortugas fishing trip and a visit to Fort Jefferson in your plans. Without question, it'll be the highlight of your holiday.